Mishka was born in London in 1992 and has studied with Imogen Cooper at the Guildhall School of Music and periodically with Richard Goode. At the age of 13 she won 1st prize in the Leschetizky Concerto Competition, New York. She has twice been invited by Andras Schiff to participate in his summer class as Gstaad as part of the Menuhin Festival and he has also invited her to give recitals in New York, Frankfurt and Antwerp. 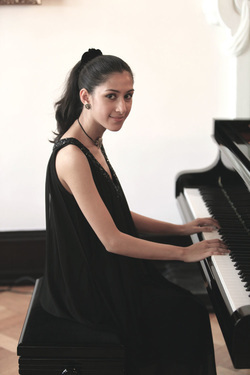 In November 2014 she was unanimously voted the 1st prize winner of the Dudley International Piano Competition. In the same year she won 2nd prize at the Cologne International Piano Competition. She has given solo recitals at the Barbican Hall, the Bridgewater Hall, and concert performances at most major London venues.